Depco is helping find new uses for the power units used by the City of New Orleans at flood prevention pumping stations constructed after Hurricane Katrina. The temporary pumping stations were created to protect the city against future storm surge by the U.S. Army Corps of Engineers; and a new, permanent flood management solution was completed in May of this year. Much of New Orleans sits at or below sea level, and throughout the city’s history of growth and expansion along the Mississippi River a complex system of levees, canals, and pumps were created to reduce the risk of flooding. In fact, when Hurricane Katrina hit the area in August 2005, the city already had 148 drainage pumps designed to reduce the effects of flooding and storm surge on low-lying areas. Unfortunately, eighty percent of the city still flooded in the aftermath of Hurricane Katrina. To secure the city against future flooding events, the U.S. Army Corps of Engineers constructed temporary water pumps and flood gates in 2006 to protect Orleans, Jefferson and St. Bernard parishes. The creation of a permanent pump system to replace the temporary structures began in 2013 by PCCP Constructors. The $725 million project was completed last year. In response, the Corps selected M.R. Pittman Group LLC to decommission the original system, including removing all materials and restoring the areas near the 17th Street, Orleans Avenue and London Avenue drainage canals to Pre-Katrina conditions. The company is currently working to remove all related above-ground equipment, machinery and buildings; with the project ending in the summer of 2020. The $17 million contract includes breaking down three pumping stations within residential neighborhoods and near local businesses and the University of New Orleans. The project also contains area improvements, including the replacement of trees removed during the construction of the temporary stations. Depco helped with the effort by purchasing 92 generators and engines from the project and is actively finding new uses for the equipment. To date, 21 units have already been repurposed. After removing the hydraulic pumps and the master skids, fourteen C18 industrial power units have been sold to a pump manufacturer located in Houston. In addition, four 3412 power units were recommissioned by a heavy equipment dealer and three 3412 power units put to work for an oil and gas company headquartered in West Texas. After receiving any necessary servicing or testing by Depco technicians at the Depco facility, the units will now help power oil rigs, other pumps and other projects throughout the world. Looking for Industrial Power Solutions for your Project? 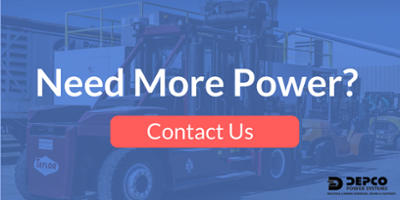 Whether you are looking to liquidate idle equipment or purchase equipment to power your next project, contact our team of specialists at 713-675-6100 to help you customize a solution today.